This week’s update from the Director of the Federal Bureau of Investigation states that they will, in fact, reopen their investigation into Hillary Clinton’s emails, during the period she was serving as the Secretary of State between 2009 and 2013. Knowing that there is just one week left before the election, the bookmaker William Hill, moved to increase Clinton’s presidency odds from 1/9 to 2/7. Which gives the Democrat candidate a 77% chance of going to the White House. The bureau has also helped Trump’s floundering campaign, which managed to hit the market lows last week. Moreover, it went to 11/2, which is approximately 14% chance of winning. Entering the final part of campaigning, William Hill decided to place Trump at 11/4. 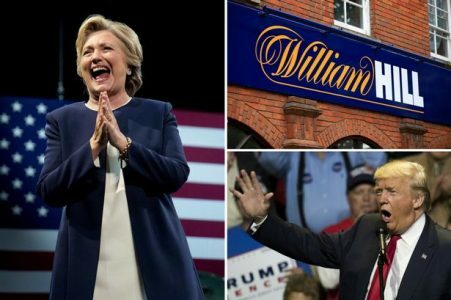 The distinguished casino William Hill, issued a few weeks ago, a market update, which states that there are some distinct similarities between the EU Referendum and Trumps’ betting patterns. Which, as we all remember, upset the bookmaker’s favoured market odds. William Hill even detailed that the market comparison moved the casino to change its odds on a Trump victory.